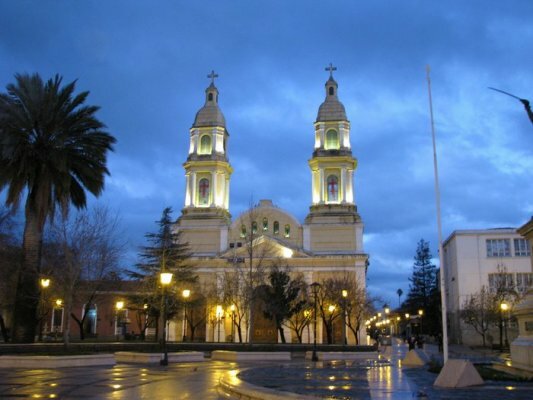 Located south of Santiago and known in the country for keeping popular traditions, Rancagua features fertile lands, handmade crafts and traditional music and customs. The mineral activity is also important to the region. You will find cupper mines, protected natural areas, the Cuaquenes Springs and Cipreses River Ski Center. Attractions: Flora and fauna. Springs and ski center. Historical and cultural interest zone. Activities: Trekking, horseback ridings, picnic, snow trekking, ski or randonne, snowboard, flora and fauna contemplation, photography. How to get there: To Cachapoal Wine Journey: Land route, by Panamericana South, until Requinoa. To Cauquenes Springs: Land route, by El Cobre highway. To Cipreses River National Reserve: Land route, by Presidente Eduardo Frei Montalva Highway. To Rancagua: Land route, by Route 5 south and Las Torres Ave.
To Picarquin: Land route, Andes direction. Weather: Moderate mediterraneo weather. There is cloudiness in the shore all year long and the temperature is homogeneous. In the interior, the temperature oscillates between day and nigth time. Rains in the Costa Cordillera and in the Andes. Services: Housing, food, roads, transportation, outdoor activities. Surroundings: Sewell, Chapa Verde Ski Center, San Francisco de Mostazal, Cauquenes Springs, La Leonera, Pelequen, San Fernando, Graneros, Rancagua, Viña Anakena, Viña Chateau, Los Boldos.